Whoa — this is my 10th dream cake! And big surprise, I made it with my favorite chocolate cake base. 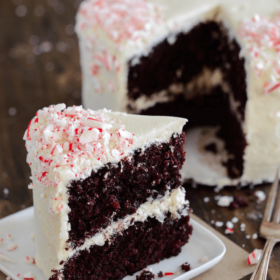 I have actually had this flavor combination in my head for the past two years and now this Christmas cake miracle has finally become a real thing! However, the first year I was pregnant and had zero interest in eating anything chocolate. Year two, I had twin newborns and I could barely make dinner…much less a cake. Turns out, Ellie was the chocolate hating baby and she still has zero taste for it. As you can see, Lyla does not have that same aversion to chocolate. In fact, if you look closely enough you will see her clutching the empty container of her mini m&ms from days ago. She keeps carrying it around hoping that more m&ms will magically appear. As soon as she spotted me taking photos of this cake, she stared me down until I gave her a few huge bites. Bless her little chocolate lovin’ heart. 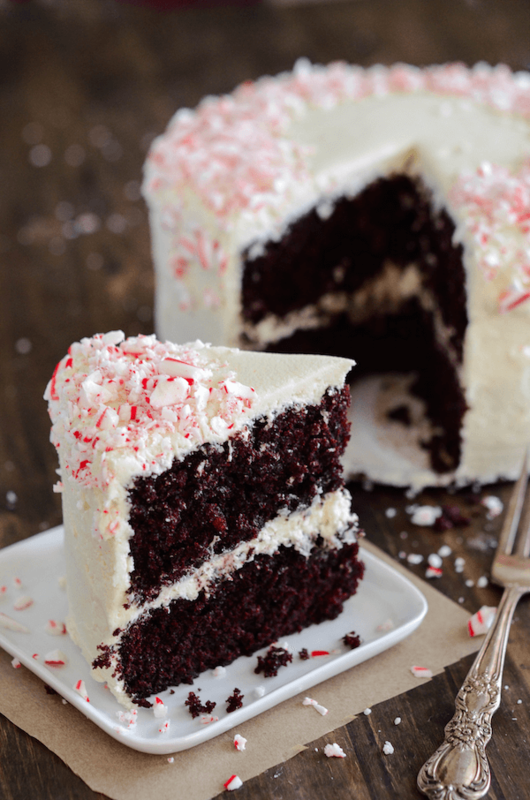 I used my favorite super moist chocolate cake base and topped it with creamy peppermint frosting and crushed candy canes. I considered adding mint to the chocolate cake as well, however I am so glad I didn’t. It was perfect as is…and any more mint would have been too much. It actually turned out tasting like a Peppermint Patty! Recipe note: If you use a different type of peppermint extract than I did, I would start with a little and taste as you go. Mint can become overwhelming if you aren’t careful. Preheat oven to 350°F. Butter two 8 inch round cake pans. Set aside. In a medium saucepan over medium high heat, combine water and sugar. Bring to a boil and stir until sugar dissolves, about 1 minute. Remove from heat and add chocolate and butter, stirring occasionally, until melted. Whisk in vegetable oil and vanilla extract. Quickly beat in eggs (do this quickly so they don’t cook) into the chocolate mixture until combined. Whisk in dry ingredients, until smooth. Divide batter evenly between prepared pans and bake for 25-30 minutes, or until a toothpick inserted in the center comes out clean. Let cakes cool in pans until cool to the touch – then frost. Cream butter and shortening in a stand mixer. Add vanilla, peppermint extract and salt. Gradually add powdered sugar, one cup at a time, beating well on medium speed. Scrape sides and bottom of bowl as needed. When all sugar has been mixed in, beat at medium speed until light and fluffy. Assemble the two cake layers with a thick layer of frosting in between the layers. Frost cake as desired. This cake is stunning! I need a piece! This cake does look like a dream! 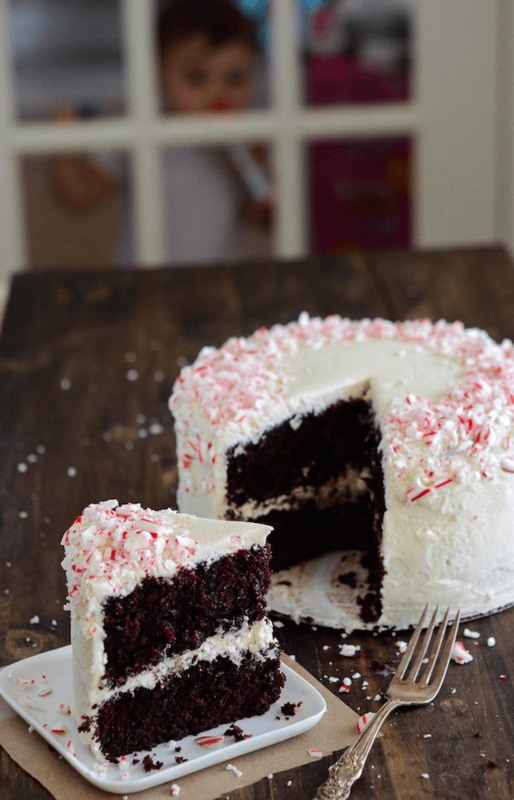 Peppermint + chocolate can do no wrong… 🙂 Love the crushed candy cane decoration! Before the picture loaded and all I saw was the heading I said to myself: “Oh no she didn’t!” But yes. Yes you did. And I can’t wait to make it! I want a slice of this cake right now! It’s absolutely gorgeous and sounds so, so good. Do you think that you could make this into cupcakes? Yes! It would make about 24 standard sized cupcakes! oh my! This cake is a stunning work of art. 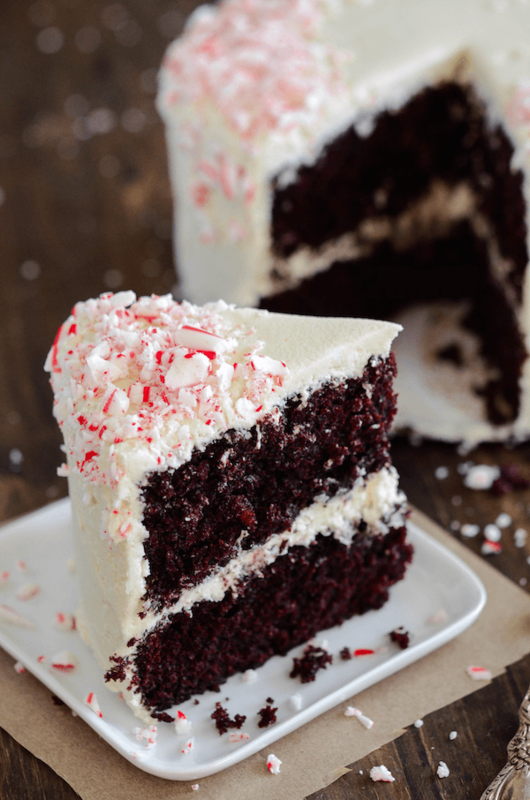 Those fluffy chocolate layers slathered with the peppermint frosting makes me want to lick the screen. The instructions say to incorporate salt into the frosting but I don’t see it listed in the frosting ingredients. How much salt? Thanks! Hi Amy! So sorry for the delayed response! Just a pinch of salt – 1/4 teaspoon! for the family- big thumbs up!! Hi Lin! So sorry for the delayed response! Just a pinch of salt – 1/4 teaspoon! Hope you enjoy this one too!! I don’t have to look further of what cake to make , as I make cakes for no reason at all!! – I just go straight to you! !I lost count making this cake- so moist and yummy, added to the list of “most liked cakes” to make at home!! Thanks Novice Chef [Jessica}! Even though I had made this yummy cake several times, can you tell me, if I’m doing it right, batter is supposed to be a little runny? Not that am complaining, the cakes are so moist, yes, MOIST and YUMMY. I also like to mention that your Red Velvet cake is as moist as the other cakes. Thank you so much for sharing. What type of dark chocolate do you use? I looked for dark chocolate in the baking area of my market, but only found milk and bittersweet (at various levels of coco…). Anything that has around 60% or more cocoa! I just made the frosting, and with 6 cups of powdered sugar, it came out so stiff even after letting the Kitchenaid work it for several minutes. I ended up adding some cream (1/2+ cup!) and 2 tsp meringue powder to make it work for me. With that, it’s delicious on a chocolate cake! Hello Jessica and family, I made this Super delicious cake for New Years Celebration which I also took the opportunity to sing happy birthday to the last 3 birthdays of the love ones before the year 2016 ended, and it came out BANGING the fact that you don”t have to use milk is awesome and the peppermint outstanding , the cake still outside the fridge and we still eating the taste has not changed .I just want to thank you, as a baker myself I can say I have found another way to make chocolate cake to delight whosoever ask for, THANKS AGAIN and may GOD bless you abundantly in this New Year 2017 and throughout your life. With much appreciation Daisy a Satisfied Central Florida Baker. Just made this cake and like mentioned above, I stopped at 6 cups of icing sugar because it was turning hard like a paste. I also added cream up to 1/4 cup but should of added more. Disappointed with the end result because it was hard to spread which made the cake crumble and it tasted too sweet and not creamy. I just made this cake. It was a total flop. Everythi g went wrong. Both layers sunk in the middle. The texture was chewy, www. The frosting was actually crumbly. I had to brush my teeth to the the taste off my tongue. Had to throw the whole thing in the garbage. I so wanted to make this for Christmas Eve…. I knew something was wrong because the 2 8-in pans were way too full. What did I do wrong? Was I supposed to boil off more of the water? Good thing I always have a brownie mix on hand!